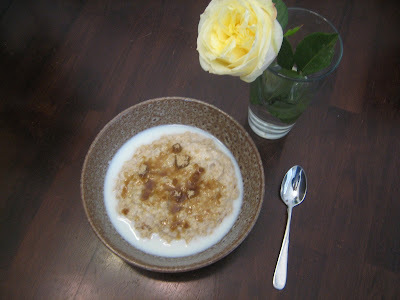 Nourish Us: This porridge is j..u..s..t right! I wish I had more memories of Grandma and Grandpa when I was growing up. The few that are alive with me today are very dear and I remember them as if they were yesterday. 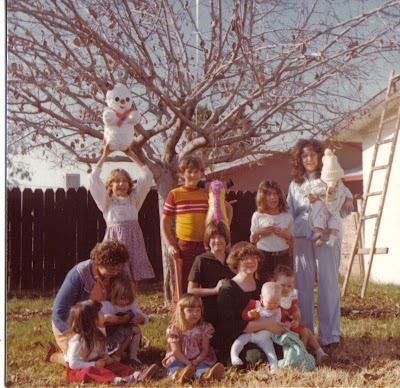 One very vivid memory in Grandma’s kitchen (where else) was at a family reunion. Probably within days of this picture when I was nine or so years old I had woken up before anyone else and made my way to the kitchen. Happy to find Grandpa playing solitaire at the table, I sat down next to him and watched quietly as he won his game. I said to him “Your cheating, Grandpa” then he said, “Go get some oatmeal!” Until this day, I win every game of solitaire I play. From what I remember, Grandpa would get up early before anyone and make a pot of oatmeal. As we woke and made our own way into the kitchen, the oatmeal was waiting to be consumed. If I have misinterpreted my memory, please let me know. I like my oatmeal on the clumpy and sticky side. It is often very difficult to achieve this texture unless the pot sits for a while and who has the time to wait? Occasionally I will eat out at Mimi’s Café where they have perfected the art of oatmeal. For anyone who does not know Mimi’s, the theme is a French Quarter New Orleans setting with French style art, music, instruments and jazz. A very fun and delicious place to eat. They serve an enormous portion of buckwheat oatmeal with sides of brown sugar, raisins, granola and milk. I like mine with the above except the granola. Today I have made a pot of this Kellerman concoction and it is as good as I remember in Grandma’s kitchen. Loretta, this is a lovely story, thank you. The bowl of porridge looks so appetising. I love to eat porridge but I've come to realise that oats don't agree with me so now I make brown rice porridge which is also delicious but doesn't have the sticky paste texture of the real thing. Thanks for letting me share you pleasure in it. This was an act of love as he believed the way to anyone's heart began with a full stomach.I miss that oatmeal, thanks for reminding me I think I'll join you in your brilliant idea for breakfast.